In Part 2 of our series on emission-reducing cars, Are You Selling looks at the plug-in hybrid electric vehicle (PHEV) – the next step towards cleaner, greener motoring, offering the best of all possible worlds. It’s midway between a traditional hybrid and a fully electric vehicle. In essence, it’s an electric car with a small petrol or diesel engine acting as a generator to recharge its batteries. So what’s the thinking behind it? It will run purely on electricity supplied by the onboard batteries for about 80 kilometres – close to the average daily driving driving range in Australia, as recent research shows. Then you recharge overnight by plugging in to a regular domesic power point, and you’re ready for the off next morning. Its secret weapon, however, is the car’s traditional fuel-driven engine. When batteries run low during driving, the engine kicks in and starts recharging them. Ingenious, hey? Here’s a whole new concept. The engine in a plug-in hybrid doesn’t actually drive the wheels. It’s purely a generator used to charge the batteries which power the electric motors. While many car manufacturers are in the planning stage with various PHEV models, which hybrid plug-ins have already hit the Australian market? 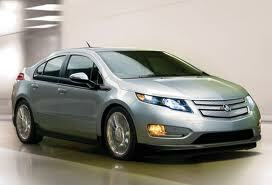 All the buzz is around Holden’s new Volt, priced at $59,990. Orders are currently being taken, but it won’t reach the streets until later in the year. With a range of 80km running purely on electric, this can be extended to about 600km with the petrol engine kicking in. It can be recharged at home or in the office in four-six hours, or at special charge points which only take one hour. It’s no slouch in terms of options, either. Models include forward collision alert, lane departure warning, eight airbags, rear view camera, SatNav, Bluetooth, MP3, USB and iPod compatibility. The Outlander is billed as the world’s first plug-in hybrid SUV, and it’s a highly sophisticated vehicle. It carries two 60kw electric motors, two inverters, a generator and a 2L petrol engine . . . an amazingly complex arrangement. It’s also highly fuel-efficent. Mitsubishi claim a combined fuel economy of 1.9L/100km. Already on sale, the Outlander PHEV is priced at $47,490 for the entry-level model and $52,490 for the flagship Aspire. The Aspire has its share of luxury features including leather seats, sunroof, SatNav, electronic tail-gate, forward collision warning and auto-braking, radar cruise control and rear-view camera. But Plug-in Hybrids come with their own problems. How green are they, really? While they run cleanly on the road, with low to no carbon emissions, they just transfer the nasty emissions to the power station during the plug-in phase. If your house or office is running on solar, hydro-electric or wind power, it’s certainly green. But most of Australia’s electricity still comes from brown coal, with up to 50% of carbon dioxide emissions coming from power stations. How convenient are they, really? They’re a great option for those with low daily car use, but not quite so convenient if you’re on the road all day, every day. You’ll need the petrol engine to cut in after 80 kms, or a one-hour partial recharge break. No doubt range and battery durability will go on improving with subsequent models and constantly updating technology. With a price between $50,000 and $60,000, these models cost far more than an equivalent car with traditional engines. And choice is limited. Two other models doing well overseas are the Volvo V60 and Ford Fusion Energi, but neither are currently available in Australia. It’s hoped the Toyota Prius Hybrid plug-in (as pictured in headline) will soon be available on the domestic market. And if you’re interested in upgrading to a new-tech model, get some tips on selling your car here. 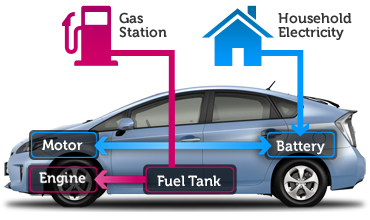 MORE: What Is A Hybrid Car?